During April 2018, we identified twelve new potters on Australian Potters’ Marks and updated seven entries with new marks. New entries include Trixy Allott, Carol Buckner, Peter Dahl, Fred’s Folly, Bev Gallop, Helen Manson, Chris Pepper, Dave Streeter, Graeme Symons, Max Tychsen, Michael Ward and Zenkali Ceramics. We continue to partner with facebook as a way of identifying new potters and marks. 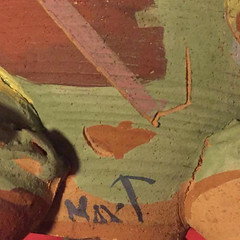 Illustrated: Max Tychsen’s painted ‘Max T’ mark.